Identity crisis? No, I'm a primary school teacher! : What does the revised EYFS Framework mean for Nursery? What does the revised EYFS Framework mean for Nursery? Generally slimming down the framework seems like a great idea, and I like the simple assessment framework it introduces at the ages of 3 and 4 for Nursery. Does this mean the end of Development Matters?...the above report says they will consider creating a slimmed down version to go with the new EYFS framework. What happens if they don't produce it though?...do we still try and use Development Matters as it stands for planning and interim assessment, or are we effectively set free within the boundaries of the new expectations at age 4? I've only just got my head round Development Matters (still struggling with how it interacts with the EYFS scale point assessment), and feel that it's brilliant for identifying children's learning steps (with the exception of ICT where it's stuck in the dark ages, and maths where I feel the learning steps aren't that well identified), but that it's a total nightmare for progress tracking and assessment! With over 300 learning steps to assess against (and plan for) I worked out that I need to write an observation every 40 seconds throughout the day for my class! Not achievable. For those of you in KS1 or 2, it's like doing APP on every child in your class across 7 subjects...oh, and by the way you actually have 2 classes, 1 in the morning and 1 in the afternoon. That means you have about 50 children in total and only 3 hours a day to teach/monitor/assess them. In fairness the marking and planning workload is somewhat lower though! 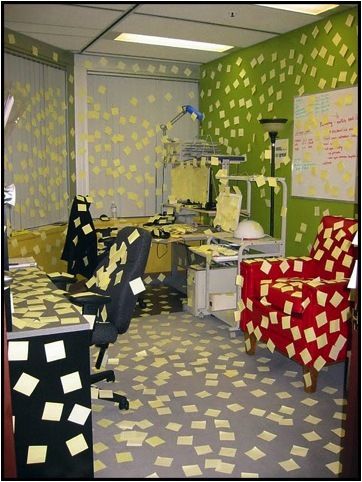 (For the uninitiated, we tend to write our child observations on post-it notes). We go to a new national curriculum in 2012 in Australia. Could be an interesting start in our Prep classrooms (5 yr olds) as we jump straight into some serious formal learning. Don't envy you, twice the number of children to assess, track and report on. Yikes! 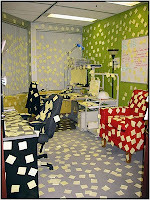 Love the post-it frenzy photo!